A son of Tapit who brought a winning bid of $700,000 at the 2014 Keeneland September Yearling Sale, Conquest Big E was always meant to be a good horse. The striking gray Kentucky-bred showed early promise, breaking his maiden impressively enough at Keeneland in his second career race to earn a start in the 2015 Breeders' Cup Juvenile (G1). He went on to finish fourth after a troubled start in the Holy Bull (G2) at Gulfstream Park the following year but managed to win only twice in his first eight starts before being included in Conquest Stables' dispersal at the 2016 Keeneland November Sale. Conquest Big E, who was trained by Mark Casse, was purchased for $110,000 and eventually joined Donna Green's stable. Through patient handling, the 5-year-old gelding has flourished during the past year and a half at Gulfstream Park, where he will vie for favoritism in Sunday's $75,000 Coast is Clear, a one-turn mile carded as Race 10. In his second start for Green last year, Conquest Big E broke through with a sharp 6 1/2-length victory over a sloppy track. He came right back to dazzle his rivals with a seven-length romp under wraps in last year's Coast is Clear over a fast track. He concluded his 2017 season with a fourth-place finish in the Iselin (G3) at Monmouth and sixth-place finish in the Ack Ack (G3) at Churchill Downs. 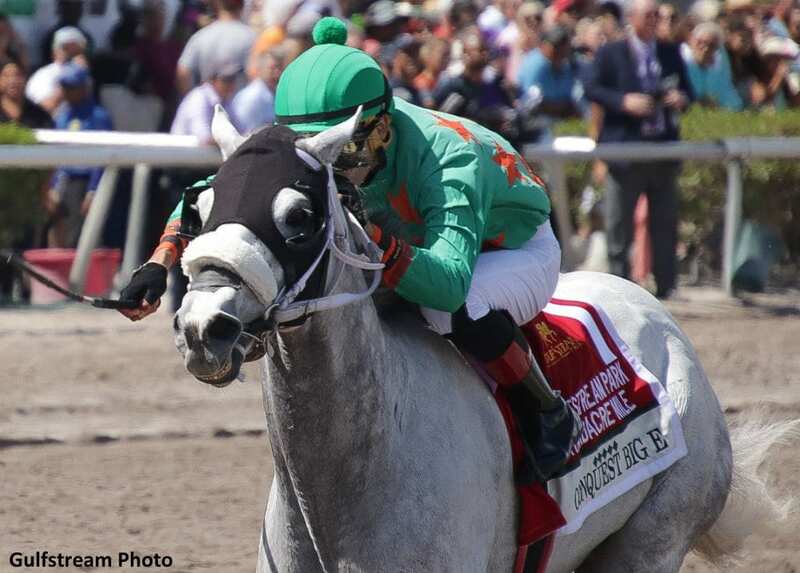 After finishing second in the Fred Hooper (G3), in which he closed to within three-quarters of a length of Tommy Macho after hopping at the start, and fourth in the Hal's Hope (G3), in which he was steadied during the early going, Conquest Big E turned in an explosive three-length victory in the March 31 Gulfstream Park Hardacre Mile (G2), defeating 2017 Kentucky Derby (G1) and Florida Derby (G1) winner Always Dreaming. With his sensational Gulfstream Park Mile score, Daniel Hurtak's Conquest Big E earned another trip out of town to run in the May 5 Westchester (G3) at Belmont Park, where he set the pace before fading to fifth. Green said Conquest's recent breezes have been 'superb' while preparing for his return to action in the Coast is Clear. Jose Batista has the return mount. Multiple-stakes winner Mr. Jordan is also scheduled to seek a rebound from a subpar showing Sunday. The Eddie Plesa-trained gelding got away from the gate slowly and was never a factor in the $250,000 Smile Sprint (G3) at Gulfstream June 30. In his previous start, Mr. Jordan broke through with his first victory in 13 starts at Gulfstream while winning the seven-furlong $100,000 Big Drama Stakes by 1 3/4 lengths over favored Kroy. Owned by David Melin, Leon Ellman and Laurie Plesa, Mr. Jordan has won nine career starts, including the 2015 Pegasus (G3) at Monmouth, while earning nearly $750,000 in purses. Edgard Zayas has the return mount aboard the son of Kantharos. Ricardo Vallejo's Deland, a Grade 1 winner in Puerto Rico, is slated to chase his first U.S. stakes victory in the Coast is Clear. After stumbling and unseating his rider in his Feb. 10 U.S. debut at Tampa Bay Downs, Deland finished second behind Imperial Hint in a $100,000 six-furlong stakes for Florida-breds at Tampa March 25 and fourth in the Big Drama. In his most recent start, as well as his first start for trainer Victor Barboza Jr., the 6-year-old son of Gottcha Gold came up just short to finish second in a two-turn June 29 optional claiming event, won by three-quarters of a length by Hy Riverside. Emisael Jaramillo is set to ride Deland for the first time in the Coast is Clear. Mar Racing Stable Hy Riverside will also cut back to a one-turn mile in the Coast is Clear. Marcos Meneses has the return mount aboard the Antonio Sano-trained 6-year-old gelding. Zipping, a homebred owned and trained by Roger Laurin, has distinguished himself as a superior mud horse while winning three of five starts on off tracks. The 4-year-old gelded son of Adios Charlie, who is undefeated in three starts over the one-turn mile distance, will be ridden by Tyler Gaffalione. Prince Tito, who finished fifth behind Zipping over a sloppy track after winning his three previous starts; Royal Holiday, who finished third behind Hy Riverside and Deland last time out; and Big Daddy, a Chilean import formerly trained by Todd Pletcher; round out the field. This entry was posted in Racing and tagged conquest big e, donna green, gulfstream park, tapit by Press Release. Bookmark the permalink.